Smash hit in Japan, and easy to see why. Adlerian psychology meets Stoic philosophy in Socratic dialogue. Compelling from front to back. Highly recommend. Had to take my time reading this one. AMAZING READ. Not that I didn't have the courage to be disliked it's actually one of my specialities but the reasoning why it's ok to be disliked and the understanding behind people disliking you and why you shouldn't give a sh*t is incredible. I highly recommend this one!!!! The Courage to be Disliked shows you how to unlock the power within yourself to become your best and truest self, change your future and find lasting happiness. Using the theories of Alfred Adler, one of the three giants of 19th century psychology alongside Freud and Jung, the authors explain how we are all free to determine our own future free of the shackles of past experiences, doubts and the expectations of others. It's a philosophy that's profoundly liberating, allowing us to develop the courage to change, and to ignore the limitations that we and those around us can place on ourselves. The result is a book that is both highly accessible and profound in its importance. Millions have already read and benefited from its wisdom. 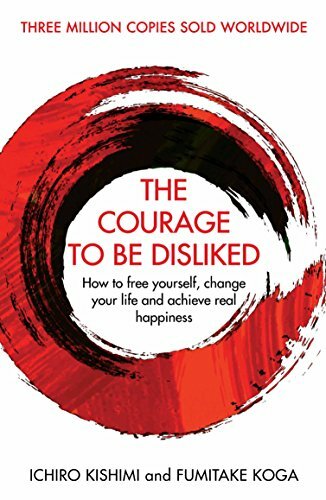 Now that The Courage to be Disliked has been published for the first time in English, so can you.